Frank E. Petersen Jr., who suffered bruising racial indignities as a military enlistee in the 1950s and was even arrested at an officers’ club on suspicion of impersonating a lieutenant, but who endured to become the first black aviator and the first black general in the Marine Corps, died this week at his home in Stevensville, Md., near Annapolis. He was 83. The cause was lung cancer, his wife, Alicia, said. He died Tuesday. The son of a former sugar-cane plantation worker from St. Croix, General Petersen grew up in Topeka, Kan., when schools were still segregated. He was told to retake a Navy entrance exam by a recruiter who suspected he had cheated the first time; steered to naval training as a mess steward because of his race; and ejected from a public bus while training in Florida for refusing to sit with the other black passengers in the back. In 1950, only two years after President Harry S. Truman desegregated the armed forces, he enlisted in the Navy. The Marines had begun admitting blacks during World War II, but mostly as longshoremen, laborers and stewards. By 1951, he recalled, the Marine Corps had only three black officers. Less confident men might not have persevered. An instructor flunked him in training and predicted he would never fly. On his first day at the Marine Corps Air Station in El Toro, Calif., a captain claimed he was masquerading as a lieutenant and had him arrested. In Hawaii, a landlord refused to rent a house to him and his wife, and admitted to a subsequent prospect that he did so because they were black. Racial discrimination was not all that General Petersen had to overcome. He discovered while training that he was afflicted with acrophobia — fear of heights. And while he longed to be a general, he was happier wielding a joystick than working as a desk jockey. Much had changed in America since 1950, he recalled in his autobiography (written with J. Alfred Phelps), “Into the Tiger’s Jaw” (1998) — and the military, originally recalcitrant, had led the charge. Promotions, job assignments and disproportionate punishments “were the three areas where racism was most likely to rear its ugly head for blacks then and, to some extent, still does today,” he wrote. Appointed a special assistant to the commandant for minority affairs in 1969, he recalled, he sought to eradicate barriers among recruits from different backgrounds, with palpable improvement. Obviously there has been progress, he said, and the military has been a model for integration. Had there been enough progress? Frank Emmanuel Petersen Jr. was born in Topeka on March 2, 1932. His father, who was born in St. Croix, was a radio repairman and a General Electric salesman. His mother, the former Edythe Southard, was a teacher. Young Frank experienced the world beyond Kansas largely through radio, and his perspective was frequently refracted through race. He enrolled in Washburn University in Topeka, but when he turned 18 and no longer needed his parents’ permission (his mother had opposed him joining the military), he enlisted in the Navy. He began as a seaman apprentice and electronics technician and in 1951 entered the Naval Aviation Cadet Program. He graduated in 1967 from George Washington University and later received his master’s degree, both while in the Marines. General Petersen’s marriage to the former Eleanor Burton ended in divorce. Survivors include their children, Gayle, Dana, Lindsey and Frank III; his second wife, the former Alicia Downes, and their daughter, Monique; a grandson; and three great-grandchildren. After leaving the military, General Petersen became a vice president for corporate aviation at Dupont de Nemours. He retired in 1997. In a video interview for the National Visionary Leadership Project, he reflected on becoming the first black Marine Corps general and the only one for nearly a decade until he retired. The remark was particularly painful for Gen. Petersen, who said he had turned to the military because he hoped it would an escape from pervasive racial prejudice in his native Kansas. Gen. Petersen, who died Aug. 25, joined the Navy in June 1950 as a seaman apprentice and the next year entered the Naval Aviation Cadet Program. 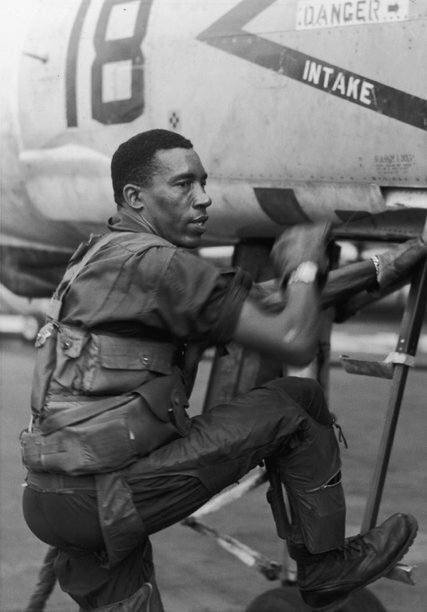 He was motivated by the recent Korean War combat death of Jesse Brown, the Navy’s first black aviator. “Quite frankly, I didn’t even know blacks were allowed into the program,” he later said. President Harry S. Truman had ordered the armed forces to desegregate in 1948, but Gen. Petersen later wrote that the Navy and Marine Corps were “the last to even entertain the idea of integrating their forces.” And whenever he left the flight training base in Pensacola, Fla., he was subjected to the indignities of the Jim Crow South. Bus drivers ordered him to the back of the coach, and he was barred from sitting with white cadets in restaurants and movie theaters. He largely swallowed the treatment, he later told The Washington Post, because he could not fight two battles at once. “I knew that I couldn’t win if I were to tackle that, as opposed to getting my wings,” he said. In 1968, he did a tour of duty in Vietnam, where he commanded a tactical air squadron and served in more than 250 missions. He received the Purple Heart for wounds suffered when he ejected after his plane was struck by anti-aircraft fire over the demilitarized zone. In all, he accumulated more than 4,000 hours in fighter and attack aircraft. In the early 1970s, he took administrative jobs and began his rapid ascent through the ranks, working to recruit more black officers and holding a command post at Marine Corps Air Station Cherry Point, N.C. In 1979, he was promoted to brigadier general and was named the NAACP’s man of the year. He became a lieutenant general in 1986 and spent the next two years as commanding general of the Combat Development Command at Quantico, Va.
At Quantico, he oversaw 7,010 military personnel and 5,930 civilians, but he drew wider media attention as the convening authority for two highly publicized trials. One was the case of Sgt. Clayton Lonetree, who was convicted in 1987 of passing secrets to Soviet agents. In the second matter, Gen. Petersen cited new, exculpatory evidence in his decision to convene a second court-martial of Lindsey Scott, a black Marine corporal who had been convicted by a military court in 1983 of having raped and attempting to murder a white woman. The highest military court overturned the initial decision, citing an inadequate defense, and Scott was acquitted in 1988. The cases, Gen. Petersen told The Post, had been “very emotional and very difficult.” He soon retired from active duty, after receiving the Distinguished Service Medal for exceptionally meritorious service, and spent many years in charge of corporate aviation for the Delaware-based chemical giant DuPont. Frank Emmanuel Petersen Jr. was born in Topeka, Kan., on March 2, 1932. His father, a native of St. Croix in the U.S. Virgin Islands, owned a radio repair shop. The younger Petersen grew up enthralled with flight, watching B-29 bombers take off at a nearby air field during World War II. While in the Marines, he received a bachelor’s degree in 1967 and a master’s degree in international affairs in 1973, both from George Washington University. He graduated from the National War College in 1973. His marriages to Eleanor Burton, Alicia Downes and Jonnie Robinson ended in divorce. Last year, he remarried Downes. Besides his wife, of Stevensville, Md., and Washington, survivors include four children from his first marriage, Dana Moore of Baltimore, Lindsay Pulliam of Alexandria, Va., and Gayle Petersen and Frank Petersen III, both of Washington; a stepdaughter he adopted, Monique Petersen of Washington; a brother; a sister; four grandchildren; and five great-grandchildren. Gen. Petersen died at his home in Stevensville, on Maryland’s Eastern Shore. The cause was complications from lung cancer, said Dana Moore. Late in his career and in retirement, the general often was asked about progress on race relations in the armed forces and society at large. He recalled the years after his return from Korea, when he continued to face vicious discrimination. He said he wore his uniform everywhere, figuring that if anyone attacked him, it would be a federal offense. Tensions exploded during the Vietnam War, when strife over perceived racism in assignments, military justice and promotion at times seemed to threaten the military’s ability to carry out its missions. He said he once encountered a cadre of eight black dissidents who felt so mistreated — and their chance of being killed in Vietnam so high — that they threatened to assassinate a white military official. Gen. Petersen said he defused the situation by asking who among the eight would volunteer to pull the trigger; no one raised a hand. He reported the plot and was named a special assistant on race relations to the Marine Corps commandant. Citing Marine figures, The Post reported in 1988 that there were 195,719 Marines, 36,882 of whom were black. Of 20,163 officers, 960 were black. At present, there are 184,355 active duty Marines, of whom 19,017 are black. There are 20,924 officers, of whom 1,115 are black. 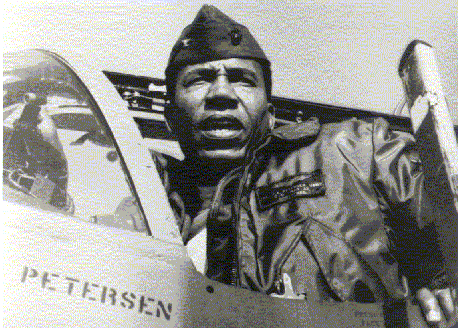 For years, Gen. Petersen was the Marine Corps’s only black active-duty general. He chronicled his struggles in a memoir, “Into the Tiger’s Jaw” (1998), written with J. Alfred Phelps. In 1988, The Post asked Gen. Petersen if his military career had real impact for black people in America.